We continue earlier studies on the indicated configuration, improving previous estimates, providing explicit expressions for the relevant forces and a formal algorithmic procedure for their calculation, and sharpening and extending the predictions for qualitative distinctions among varying types of behavior that can occur. We include graphical representations for some of the more significant relations, as an aid to interpretation and for eventual design of experiments to test the physical relevance of the new material. 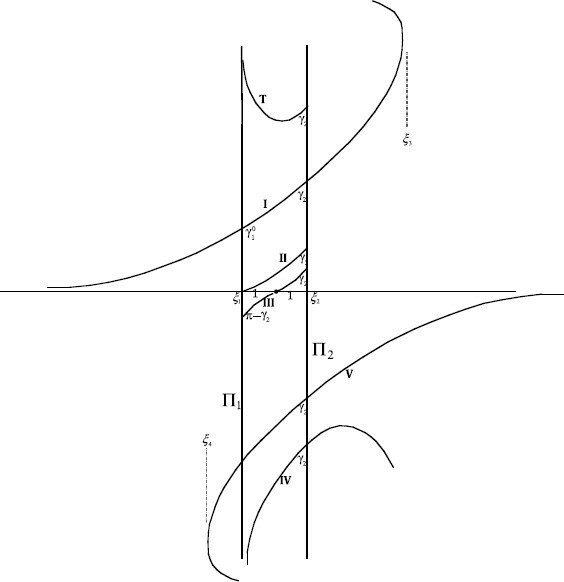 where ψ is inclination of the curve with the horizontal, and u is the height above the level at infinity. This equation asserts geometrically that the planar curvature ( sin ψ ) x of the interface is proportional to the height u ( x ) above the (uniquely determined) level u = 0 at infinite distance from the plates (see, e.g., Theorem 2.1 of ). 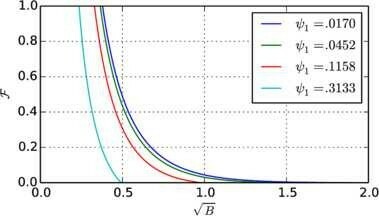 We assume in this work that the proportionality factor κ > 0 , as occurs for a non-zero gravity acceleration g directed downward toward the fluid. Physically, κ = ρ g / σ , where ρ is density change across the interface and σ is the surface tension arising from the fluid/fluid interface. In the non-dimensional coordinates, the plates are always two units apart. The physical concept of plate separation is replaced by the magnitude . d U d ψ = sin ψ B U .
for any solution of (1.3) with inclination ψ α at height U α .
on any interval on which ψ is monotonic in ξ. Note that (1.5) relates three distinct points on the solution curve, any two of which may coincide. We shall have to take pains in each instance to ensure that the correct branches for the roots are used. One sees easily that aside from the trivial solution U ≡ 0 of (1.1+), inflections of a solution curve occur exactly at crossing points of that curve with the ξ-axis, that at most one such point occurs on any solution, and that the sense of monotonicity of ψ reverses at every such point. Thus when such a crossing occurs, the integral in (1.5) must be split into two parts with the senses of integration reversed. We observe that only a single inflection can occur on any solution curve, see the assertions (1) to (5) in Sec. II of . ξ = ξ α − 1 2 B ∫ ψ ψ α 1 + cos τ cot τ d τ , U = 2 B ( 1 − cos ψ ) . Here ξ α refers to the plate position, and ψ α is the inclination on that plate. Note that four distinct solutions appear, depending on the signs of the non-constant roots. The constant root 2 B is taken as positive. In Figures 1, 2, 3, particular integral curves T, I, II, III, IV, IV 0 , and V are sketched for the subset S 2 of solutions of (1.1) in the interval between the plates and meeting Π 2 in the prescribed angle γ 2 , and for successively decreasing plate separations. We have chosen for convenience 0 ≤ γ 2 < π / 2 . In the figures, some of the curves are extended beyond the plates as solutions, at least to the extent to which they can be represented as graphs. The sketched curves serve as barriers for distinguishing the qualitative structures of general solutions. No two of the curves in S 2 can cross each other within the interval in which both are graphs, and the regions between adjacent barriers serve to distinguish specific global behaviors. In the ensuing context, we discuss in detail the specific roles of the indicated curves. For convenience, we provide here a preliminary outline of essential features. The curves I and V are determined by (1.6) with α = 2 and choosing respectively the positive and negative signs for the non-constant roots. IV 0 is the unique curve of S 2 meeting Π 2 at its crossing point ( ξ 2 , 0 ) with the ξ-axis. These three curves are rigidly attached to Π 2 and are independent both of the position of Π 1 , and of the contact angle γ 1 . T is the ‘top’ barrier, in the sense that there are no higher solution curves of S 2 . II is the unique curve of S 2 meeting Π 1 at its crossing point with the ξ-axis. III is the symmetric solution, meeting Π 2 in angle γ 2 and Π 1 in angle γ 1 = π − γ 2 . It crosses the ξ-axis at the midpoint between the plates, independent of plate separation. IV is the unique curve of S 2 that meets Π 1 in angle π.
using positive roots. The corresponding value 2 B 0 is determined by (3.1). The two crucial values for are illustrated in Figure 4. The half plate separations B 0 and B cr . in units of σ, with B 0 = κ a 0 2 .
in units of σ, tending to separate the plates. We note the immediate universal bound, | F | < 2 for every repelling configuration. 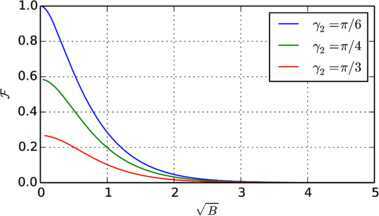 2 B = ∫ − π / 2 ψ 2 cos τ d τ B U 2 2 − 2 ( cos τ − cos ψ 2 ) . For given ‘dimensionless plate separation’ 2 B , relation (2.1) uniquely determines the (positive) height U 2 for which the solution meets Π 1 in the contact angle γ 1 = 0 and Π 2 in the prescribed angle γ 2 . 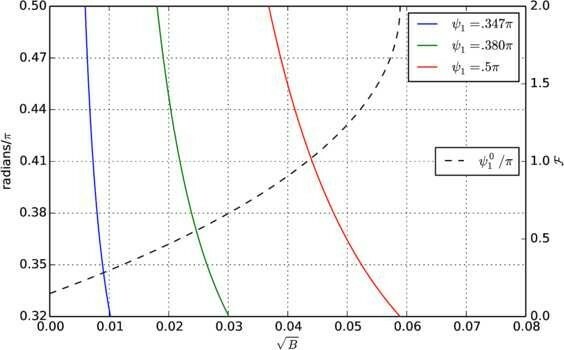 The value U 2 thus found is the highest initial position U 2 for which the solution in S 2 extends to meet the plate Π 1 . We designate this solution with T. It forms an upper barrier for all solutions in S 2 that extend as graphs to meet Π 1 . The dependence of the plate heights U 1 , U 2 on is illustrated in Figure 5. The intersection heights U 1 , U 2 with the plates, as functions of half plate separation ; γ 2 = π / 6 . Referring to any of Figures 1, 2, 3, we see that the two plates together with T and I determine a non-null closed region R T - I , topologically a disk, which is simply covered by a subset of solutions in S 2 , all of which yield attracting forces (or zero force in the unique case of I). We obtain such a region for every choice of ‘plate separation’ 2 B > 0 . If B > B cr , then for the given γ 2 no further attracting solutions can be found; all further solutions in S 2 will be repelling. 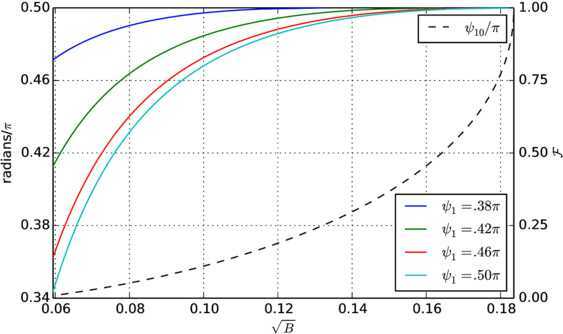 But if B = B cr , then IV and V coincide, providing a negative solution yielding zero force; if B < B cr , then IV moves below V and there is a new region R V - IV of negative solutions providing attracting forces (Figure 3). Thus when the plates are close enough to each other, two complementary regions appear, one of positive solutions and the other of negative solutions, both of which yield attracting forces between the plates. The curve II is the unique element of S 2 whose height vanishes on Π 1 . The region R I - II between I and II is again simply covered by solutions in S 2 . 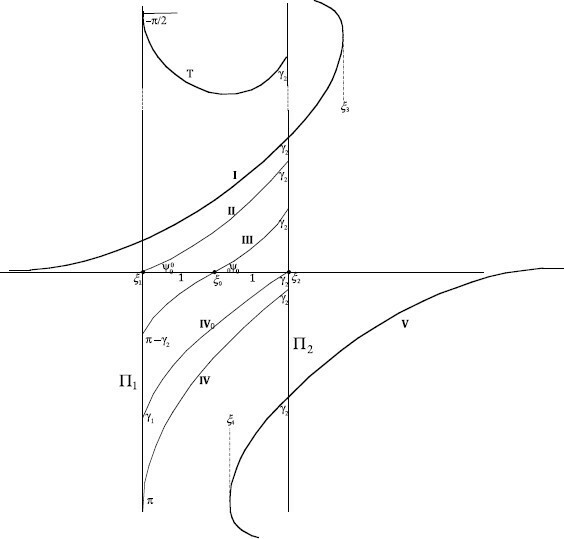 All these curves lie in the upper half-plane within R I - II but intercept the ξ-axis when extended, and thus provide repelling forces. III is the symmetric solution, achieving on Π 1 the contact angle γ 1 = π − γ 2 . This curve has special properties as we shall see below. Within the region R II - III , all curves of S 2 are repelling; all curves cross the axis and the sense of monotonicity of ψ in x reverses on crossing, so that special precautions must be taken in the representations. Corresponding comments apply for R III - IV when B > B cr . In that event, there are no solutions in S 2 below IV, and IV then plays to some extent the role at the bottom that T plays at the top, the adjacent solutions being, however, repelling rather than attracting. If B < B cr , then a region of repelling solutions R III - V is created, as is the new region R V - IV of attracting solutions. IV, however, retains its property of being a lower barrier below which there are no elements of S 2 . 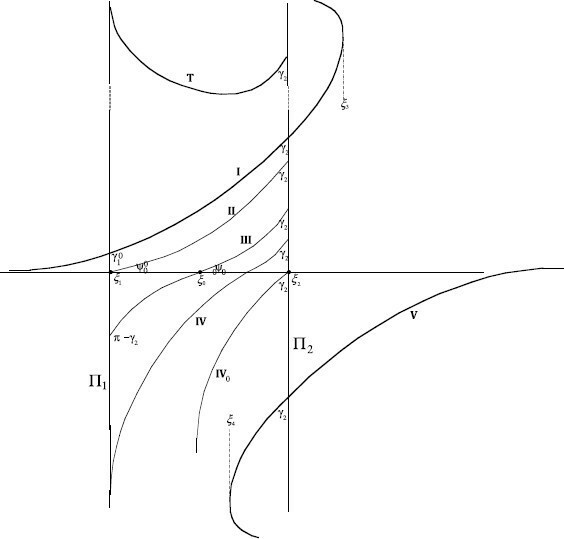 All barrier curves have the common inclination ψ 2 = π / 2 − γ 2 on Π 2 . They are distinguished by the choices of angles γ 1 = ψ 1 + π / 2 with which they intersect Π 1 .
a relation uniquely determining the (negative) U 2 at which IV meets Π 2 . B U 1 2 = 2 cos ψ 0 , B U 2 2 = 2 ( cos ψ 0 − cos ψ 2 ) . These are determined by (1.6), using appropriate signs for the roots. Note that U 2 2 is the same for both curves. Under our choice 0 ≤ γ 2 < π / 2 , I always extends to meet both plates, however V does so only if B ≤ B cr . since there is no contribution from below the axis. We then obtain the height U 2 from the second of relations (3.4). B = ∫ ψ 0 0 ψ 2 cos τ d τ 2 ( cos 0 ψ 0 − cos τ ) . Again we find U 2 from the second equation in (3.4). By symmetry, U 1 = − U 2 . The barrier III has the unique property, that if γ 2 is fixed and the separation 2 a → 0 , the configuration remains repelling, with III asymptotic to the symmetric linear segment inclined at π / 2 − γ 2 to the axis and joining the plates. We proceed to calculate the forces between the plates in varying configurations. In practice, the accessible parameters will generally be the contact angles ψ 1 and ψ 2 on the sides of the plates facing each other, and the dimensionless plate separation . Other parameters, such as the height of the contact points U 1 and U 2 with the plates or the height of a local extremum or position of the crossing point with the ξ-axis, can be substituted via relations (1.4)-(1.6). Our basic force relations are (1.8) and (1.9), corresponding respectively to the attracting and repelling cases. The results for varying configurations are illustrated in Figures 6-13. The angle ψ 1 0 from ( 4.2 ). The net attracting force, from ( 4.4 ), with γ 2 = π / 6 . The force vanishes when γ 1 = γ 1 0 . 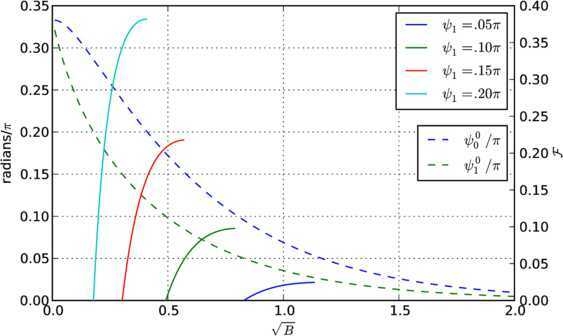 Attracting forces, negative solutions: plots of ( 4.5 ) and ( 4.6 ) assuming γ 2 = π / 6 . Solid lines indicate forces at the specified ψ 1 (right vertical axis). Dashed line indicates ψ 1 0 (left vertical axis). Repelling forces, positive solutions: plots of ( 4.2 ), ( 4.7 ), ( 4.8 ), γ 2 = π / 6 . Solid lines indicate forces at the specified ψ 1 (right vertical axis). Dashed lines indicate specified angles (left vertical axis). Equations ( 4.7 ) and ( 4.9 ); γ 2 = π / 6 . Equation ( 4.10 ); γ 2 = π / 6 . Forces on the symmetric curve III. 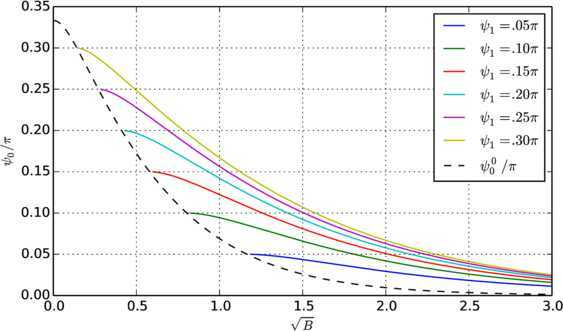 Plots in range B cr < B < B 0 based on ( 4.18 ) and ( 4.19 ). Note that for γ 2 = π / 6 , B cr = 0.0594 and B 0 = 0.1834 hold. which uniquely determines ψ 1 0 for any prescribed separation 2a. Thus, for the given ψ 2 , attracting solutions prevail whenever − π / 2 ≤ ψ 1 < ψ 1 0 . 2 B = ∫ ψ 1 ψ 2 cos τ d τ B U 0 2 + 2 ( 1 − cos τ ) . which determines ℱ uniquely in terms of the contact angles on the plates and the separation. 2 2 B = ∫ ψ 2 ψ 1 0 1 + cos τ cot τ d τ . 2 B = ∫ ψ 1 ψ 2 cos τ d τ 2 ( 1 − cos τ ) − F .
2 B = ∫ ψ 0 ψ 1 cos τ d τ 2 ( 1 − cos τ ) − F + ∫ ψ 0 ψ 2 cos τ d τ 2 ( 1 − cos τ ) − F .
tan 0 ψ 0 < u 2 / a = U 2 .
yielding a perfunctory but conceptually useful bound for ℱ that could be improved in detail by using again the left-hand side of (4.13). Actually, the force for large a vanishes exponentially in a as follows from the general estimates of Siegel . as the plates approach each other. Corresponding to fixed contact angles γ 1 and γ 2 on the plates, no other solution curve shares this behavior. The above force calculations apply for any choice of separation 2a. To continue with solutions joining the plates but situated below III, we distinguish cases according to the plate separation. In this event IV lies above IV 0 , see Figure 1. The range of inclinations ψ 1 achieved in the corresponding region R III - IV is π / 2 − γ 2 < ψ 1 ≤ π . All solution curves cross the x-axis between the plates, and the force calculation proceeds as in (4.9), (4.10), with the extended range for ψ 1 . We shall see, however, in Section 5 that from the point of view of limiting behavior as the plates approach each other, it would not be appropriate to join this region with the preceding one. No solutions meeting both plates and achieving the contact angle γ 2 on Π 2 exist below IV. 2 2 B = ∫ ψ 2 ψ 10 cos τ d τ cos ψ 2 − cos τ . 2 B = ∫ ψ 2 ψ 1 cos τ d τ 2 ( 1 − cos τ ) − F .
2 2 B = ∫ ψ 2 ψ 1 ∞ cos τ d τ 1 − cos τ . The net force arising from each curve in R IV 0 - V is then obtained from (4.19). With given contact angles on the two plates (corresponding to prescribed materials), we investigate the consequences of varying the separation of the plates. We effect the change conveniently by holding Π 2 fixed and displacing Π 1 in either direction. It is crucial to observe that in such a displacement, the barriers I, IV0 and V are rigidly attached to Π 2 (and hence remain fixed), and the barrier III continues to pass through the midpoint on the x-axis. II and IV move downward as a decreases. The set S 2 of solutions examined is rigidly attached to Π 2 and does not change as Π 1 is shifted; however, the choice of elements within S 2 must change to maintain prescribed conditions on Π 1 . Note that the geometric locus of II - when considered as an element of S 2 determined by its contact angles with the plates - moves upward in the family with decreasing a, but when considered as defined by its property of passing through the intersection of Π 1 with the x-axis, it moves downward. We distinguish the initial ℛ-regions and examine what happens to a typical solution curve in each such region, with decreasing a. In a given configuration, there are no solutions above T that meet Π 2 in angle γ 2 and extend to Π 1 . 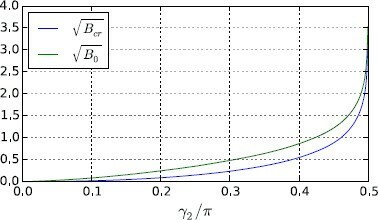 If we allow a to decrease with γ 1 and γ 2 fixed, a new T+ appears, lying above T. There are no solutions above T+, but the original S 2 is extended with the new (attracting) solutions in the region R T + - T , consisting of solutions that previously did not extend to Π 1 . 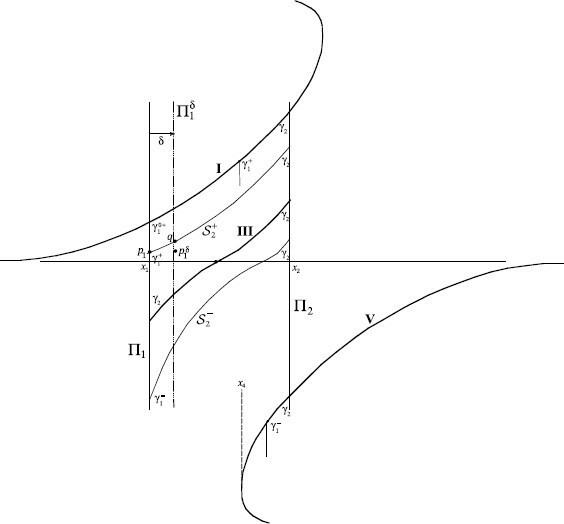 Every curve above T and meeting Π 2 in angle γ 2 eventually falls into this category, as a decreases toward zero. We consider a particular such curve of S 2 , displace Π 1 toward Π 2 , and ask what must be done to preserve the original angle γ 1 on Π 1 . Since is convex upward, the angle γ 1 with Π 1 will increase when Π 1 is displaced toward Π 2 . To retain the original angle γ 1 , one must move to a curve above the original one. 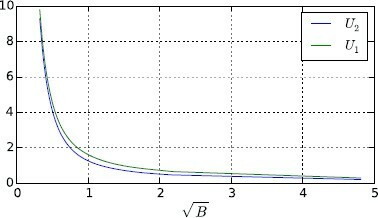 As a consequence, every curve of S 2 lying above I moves upward and remains attracting following the displacement. Additionally, new attracting curves will appear above T, as noted in 5.1. ( sin ψ 2 − sin ψ 1 ) 2 4 B − 2 ( 1 − cos ψ 2 ) < B U 0 2 < ( sin ψ 2 − sin ψ 1 ) 2 4 B − 2 ( 1 − cos ψ 1 ) . ( sin ψ 2 − sin ψ 1 ) 2 4 B − 2 ( 1 − cos ψ 2 ) < B U 0 2 < ( sin ψ 2 − sin ψ 1 ) 2 4 B . The crossover value ψ 1 0 is uniquely determined by the particular case (4.5) of (5.1). The normalized attracting force ℱ can now be estimated using (4.1). Relations (5.2a), (5.2b) provide an explicit version of Laplace’s discovery  that the attracting forces remain attracting and become unbounded as the inverse square of the distance between the plates, as the separation decreases to zero. In the event B < B cr , a second interval R IV - V of (negative) attracting solutions appears above IV and below V. For γ 2 in the range 0 ≤ γ 2 < π / 2 we have chosen, the discussion for these solutions is analogous and somewhat simpler than the one just given, as in no case does the (negative) maximum U 0 appear between the plates. Again attracting solutions remain attracting as plate separation decreases; the estimate (5.2a) prevails, albeit with ψ 1 and ψ 2 interchanged. This case is discussed in explicit detail in ; we include here in outline form some essential features, returning for explicit convenience to direct physical notation. To begin, let us look at the point p 1 on Π 1 , as in Figure 4. When Π 1 is displaced an amount δ toward Π 2 , the horizontally displaced p 1 δ will encounter too large an inclination from the element of S 2 passing through that point, as that element will have the same inclination ψ 2 on Π 2 as does the indicated solution S 2 + , and at every position x between the plates, its height u is smaller than that of that solution and thus by (1.1) its curvature is smaller. Thus the inclination of the field element at p 1 δ exceeds that at q, which in turn exceeds that at p 1 . Therefore in order to attain the initial slope again, one will have to move upward on the displaced plate Π 1 δ . Since ψ 1 > 0 , and high enough points on Π 1 δ yield ψ 1 δ < 0 , a (unique) such point can always be found. We observe now that on the original vertical segment of Π 1 joining I and II, ψ 10 < ψ 1 < ψ 1 0 < ψ 2 holds (see Figures 1, 2, 4 for notation). Thus the angle ψ 1 is attained at some intermediate point on I between Π 1 and Π 2 . We choose δ so that Π 1 δ passes through that point. The solution curve then has the identical data on the two vertical plates as does I, and by the uniqueness theorem (see ) must coincide with I. Looking more closely, we see that by moving Π 1 continuously toward Π 2 , we obtain a continuous family of solutions joining the plates, with left-hand end points rising in the motion, and such that at some intermediate position strictly between the plates, the solution will coincide with the portion of I to the right of that point. Once that happens, all further motion of Π 1 to the right leads to attracting solutions to which the material of preceding sections applies. 2 κ ( 2 a − δ c ) = ∫ ψ 1 ψ 2 1 + cos τ cot τ d τ . For any chosen ψ 1 within its range, we obtain a picture of a succession of solution curves, defined over successively shorter subintervals attached to Π 2 between the plates, each successively closer to I and yielding successively smaller repelling forces, until the solution curve coincides with a non-null portion of I, providing zero force. See Figure 14. 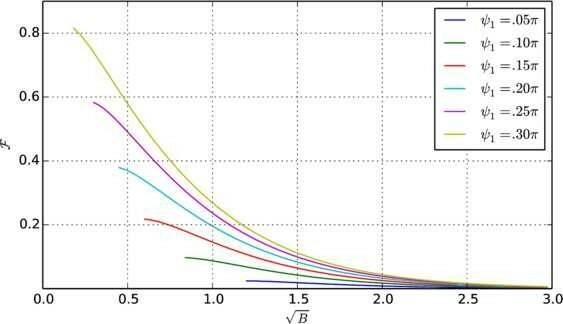 Behavior of solution curves with changing plate separation; contact angles prescribed. 2 a 2 κ = ∫ ψ 1 ψ 2 cos τ d τ cos ψ 0 − cos τ .
d 02 2 κ = ∫ ψ 0 ψ 2 cos τ d τ cos ψ 0 − cos τ . These are still repelling solutions as they continue to cross the x-axis. Nevertheless, there are significant changes from the case just considered, as the initial heights on Π 1 are negative. The sense of curvature of the solution curves reverses in the negative region, and account must be taken of that change in two senses. 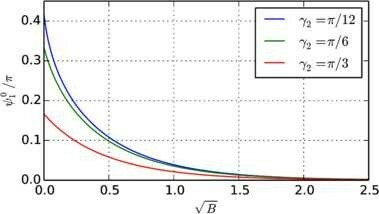 2 κ d 2 = ∫ ψ 0 ψ 2 cos τ d τ cos ψ 0 − cos τ . A further change in behavior occurs in that if one moves Π 1 a small distance δ toward Π 2 , one finds that to maintain the same initial angle ψ 1 , one must look downward instead of upward as before. As a consequence, the new solution curve lies below the previous one, it will be further from I than was the previous one, and will increase the repelling force rather than decreasing it as above. Nevertheless, it turns out that the sequence of solutions thus constructed converges to a segment of I just as did the previous one. This assertion may at first seem in conflict with the behavior just described; however, one can show that although the solution curves at first diverge from I, their starting points on the intersections with the successive Π 1 δ planes actually rise and become positive prior to reaching Π 2 . Once that happens, the discussion of 5.4 applies again without change, and the corresponding behavior is observed. A complete proof of this behavior appears in . We see that if the initially chosen ψ 1 lies in the range R II - III , then, as the plates are brought together, the repelling force will initially strengthen to a maximum, and then will weaken to a critical separation at which the solution coincides with I and yields zero force, and will finally become attracting with force increasing as the inverse square of the separation, according to (5.2a), (5.2b). a remarkable formula yielding explicitly the maximum repelling force achievable by bringing the plates together, whenever the prescribed datum ψ 1 is chosen from the range R II - III . As a corollary, we see that the absolute maximum repelling force for all configurations on or above the symmetric one III appears with III itself, when ψ 1 = ψ 2 . As we move downward through the range R II - III , the angle ψ 1 increases from the angle ψ 10 with which II cuts the x-axis to the angle π − γ 2 = ψ 2 , achieved by III. The curve III itself fails, however, to become attracting with decreasing separation; we see that immediately since, due to its symmetry, it cuts the x-axis for every separation. In Section 4S we have already established upper and lower bounds for the repelling force in this case, notably the non-zero limit F 2 = 2 ( 1 − cos ψ 2 ) as the plates approach each other. The material above together with what is to follow shows that III is isolated in this respect; every other configuration with fixed angles on the plates becomes attracting as the plates come together, of magnitude rising to infinity as the inverse square of the separation distance. Thus there is a very striking singular limiting behavior in configurations adjacent to the symmetric one. Physically, this corresponds to liquid going to positive infinity when it is initially above III, and to negative infinity when it is initially below III. It should be of interest to observe this transition experimentally. We continue to discuss the remaining cases that occur; to this purpose we return to non-dimensional notation. This is illustrated in Figure 1. A new region R III - IV appears with ψ 1 in the range ψ 2 < ψ 1 < π / 2 . Since all these angles exceed ψ 2 , they cannot reappear on the curve I as happens for initial datum above that of III, and thus the convergence to a segment of I does not recur here. We observe that the range of ψ 1 that appears is identical to the range of ψ on the portion of V between the plates. Since ψ is monotonic on V, there is a unique point on this arc at which the initially chosen value of ψ 1 appears, see Figure 4. Denote by x ∗ the x-coordinate of that point. When Π 1 is moved toward Π 2 , one finds one must move downward from the initial height in order to achieve again the same initial inclination ψ 1 . Thus the succession of solution curves moves toward V, with the repelling force decreasing. The exotic behavior noted in 5.5 above, with repelling force initially increasing as the plates come together, does not reappear for the region below III. When Π 1 is situated at x ∗ , the data of the relevant solution curve at its two endpoints coincide with those of V at those points, and thus the two curves coincide on the interval ( x ∗ , x 2 ) , with vanishing force. Further approach of Π 1 toward Π 2 yields attracting solutions, with forces controlled by (5.2a), (5.2b). 2 a κ = ∫ ψ 2 ψ 1 cos τ d τ F / σ + 2 ( 1 − cos τ ) . In the present case a > a 0 , there are no solutions below IV joining the plates and which meet Π 2 in the prescribed angle γ 2 . For characterization of IV, see Section 3.1. The relevant picture for the initial configuration is now Figure 2. We obtain two new regions for repelling solutions, viz. R III - IV 0 and R IV 0 - IV . All solutions are repelling and cross the axis between the plates. The configuration is fully analogous to that of R II - III , and analogous considerations apply. See Section 5.5. The repelling forces successively increase to a maximum of 2 σ ( 1 − cos ψ 1 ) , then solutions move to V and proceed to cross over and become attracting. All solutions are repelling and cross the axis outside the plates. The situation is essentially that of R I - II . As the plates move together, the repelling force decreases monotonically to zero and then attracting forces prevail. See Section 5.4. The situation is now essentially analogous to the initial discussion for curves lying above III. We remark the technical distinction that the minimizing point on the upper barrier arc T lies always between the plates; those for the corresponding lower barriers lie to the right of Π 2 , although they approach that plate with decreasing separation 2a. After completing this work, we were informed by John McCuan of an earlier paper  in which some of the material relates closely to the topic of the present study. Our contribution can be regarded as an improvement on Section 4 of , in the sense that we study the question in the context of the fully nonlinear equations, in preference to the linearization adopted in that reference. The particular geometry of the configuration permits us to integrate the equations explicitly in original form, yielding expressions that describe general physical laws. Beyond the evident improvements in precision and detail, we were led to the discovery that the net attracting (repelling) force on the plates is independent of the contact angles that occur on their outer sides; thus the restriction made in  to plates with identical angles on the two sides is superfluous. We find also the general theorem that the net force is repelling or attracting, according as the (extended) solution curve joining the plates in a vertical section does or does not contain a zero for the height on its traverse, the net force being then provided respectively by the elementary formulas (1.9) or (1.8). We obtain additionally a more complete description of the limiting behavior as given plates approach each other (this behavior becomes dramatically singular for solutions close to the symmetric one; see Section 5 of the present work). The exact formal theory was additionally a help for us toward avoiding misleading inferences suggested by the linearization, among them the erroneous statement in  opening the final paragraph on p.819: ‘This result shows that vertical plates…will attract if they have like menisci and otherwise repel…’. In fact (as shown in Section 4AP) for any plate separation and acute angle γ 2 , the solutions in the non-null subset of R T - I for which γ 1 > π / 2 have unlike menisci at the plates and for these solutions the plates nevertheless attract each other. The latter author is indebted to the Mathematische Abteilung der Universität and to the Max-Planck-Institut für Mathematik in den Naturwissenschaften, in Leipzig, for invaluable support during preparation of this work. Both authors contributed equally in this work, in all respects.